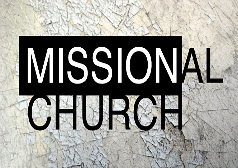 The term "missional" is commonly used as part of the emerging church vocabulary. The following article explains what the term means. In other words, the belief is that traditional Bible believing Christianity must be completely re-invented to become an all embracing belief system that teaches there are many ways to God. Jesus said there is one way that leads to heaven, and that He was the only way. If you choose to accept the "missional" definition of Christianity then you will be on the wide way that leads to hell separated from Jesus Christ for eternity. September 16 - What is a 'missional' church? We hear others talk about what they are "doing" at their church. And we tell people what we are "doing" at our church. But what Christians in all denominations are asking themselves and others is, are "doing" and "being" a Christian the same thing? Something new is being discussed and embraced by Christians around the world. Many Christian writers are saying that the rise of the missional church is the single biggest development in Christianity since the Reformation. Just as the medieval church was different from the church we see in the Book of Acts, the church after the Reformation looks totally different from its medieval predecessor. And the emerging missional church will just as dramatically distinguish itself from what we now call "church." Missional church is a way of living, not an affiliation with a group or an activity. To think and to live missionally is to see all of life as a way to be engaged with the mission of God in the world. This missional understanding of Christianity is literally "undoing" Christianity as a collection of man-made traditions and recreating it as the family of believers God planned and that we see in the New Testament. The shifts go way beyond denominational affiliations, worship styles, program approaches or cultural stances. The missional development goes to the very heart of what the church is, not just what it does. It redefines the church's role in the world in a way that breaks sharply with what many churches think. The result of this shift will be that, within a few years, it will be impossible to think of church in the way we used to, as something we "went to" or "participated in" or "joined" or "attended." The idea of missional church is being embraced by thousands of churches across the country. But to be missional requires a new "scorecard" for being successful as a congregation. The typical church scorecard (how many, how often, how much) doesn't mesh with a missional view of how the church monitors success. The current scorecard rewards church "activity" and can be filled without any interaction with the community beyond the church doors. It promotes the internally focused, program and church-based side of the ledger.